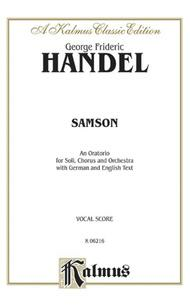 Samson (1743) (SATB with SATBB Soli (German, English Language Edition)). Composed by George Frideric Handel (1685-1759). Choir Sacred. SATB choir. Choral (Sacred); Choral Worship Cantata; Larger Works; Masterworks; Worship Resources. Kalmus Edition. Baroque; Masterwork; Sacred. Book. 280 pages. Published by Kalmus Classic Edition (AP.K06216).ISBN 0769230903. Baroque; Masterwork; Sacred.